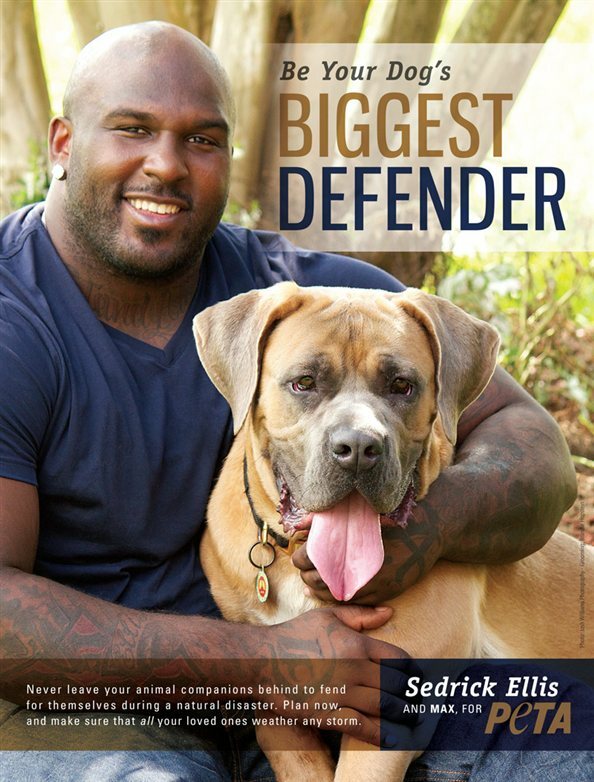 New Orleans Saints player Sedrick Ellis lives up to his team's name in his PETA ad encouraging folks in the Big Easy and elsewhere to make plans to take care of animal companions before emergencies happen. 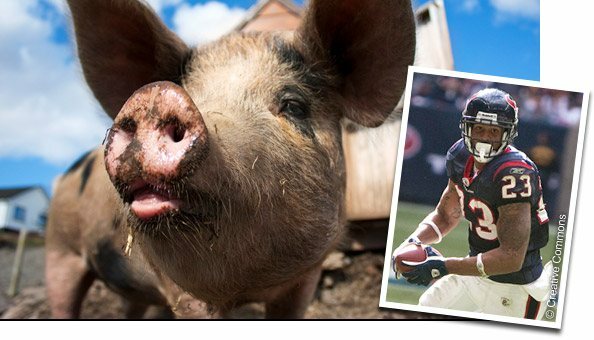 Houston Texans running back Arian Foster makes my hometown proud with his outstanding skills on the field and makes animal advocates cheer for his embrace of healthy and humane vegan foods. 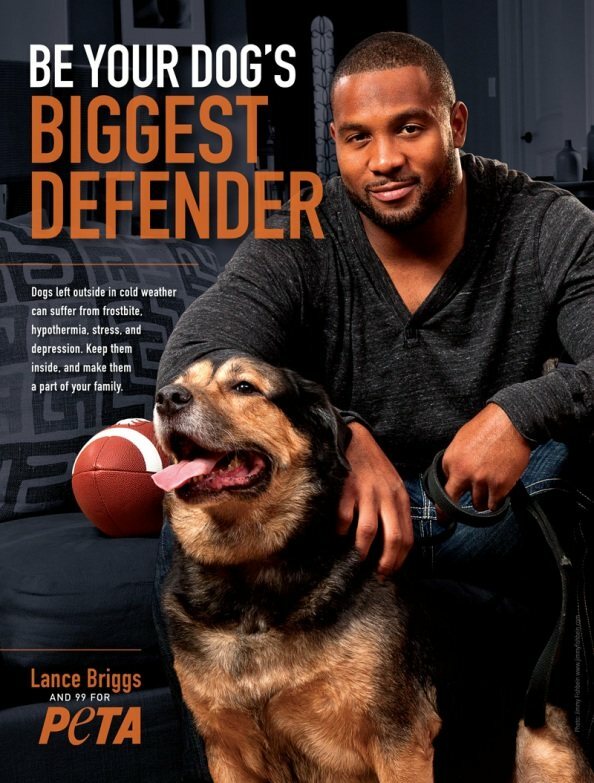 Playing in the Windy City, linebacker Lance Briggs knows what cold weather can feel like, which is why dogs don't belong outside in the wintertime, as his PETA ad explains. 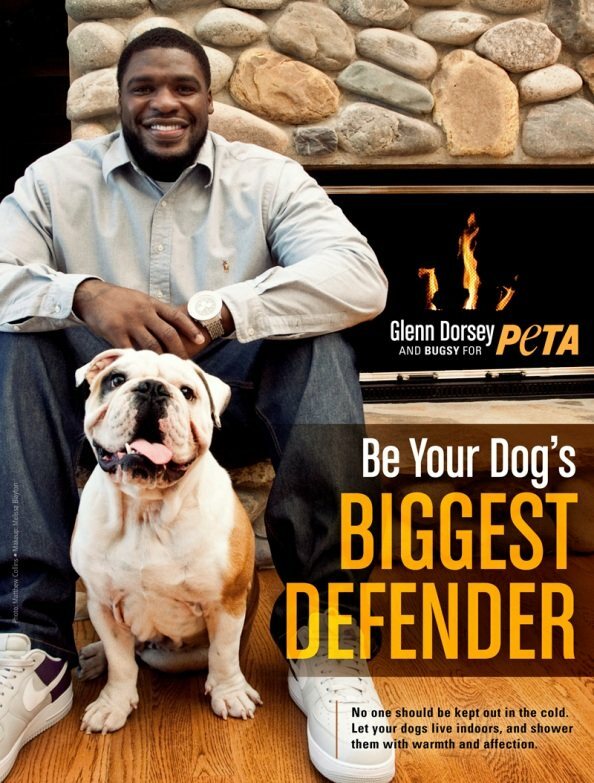 Also speaking up for cold dogs is Glenn Dorsey, who posed for a PETA ad with his dog Bugsy, of whom he said, "Bugs don't care if we win or lose, he's still gonna love me." 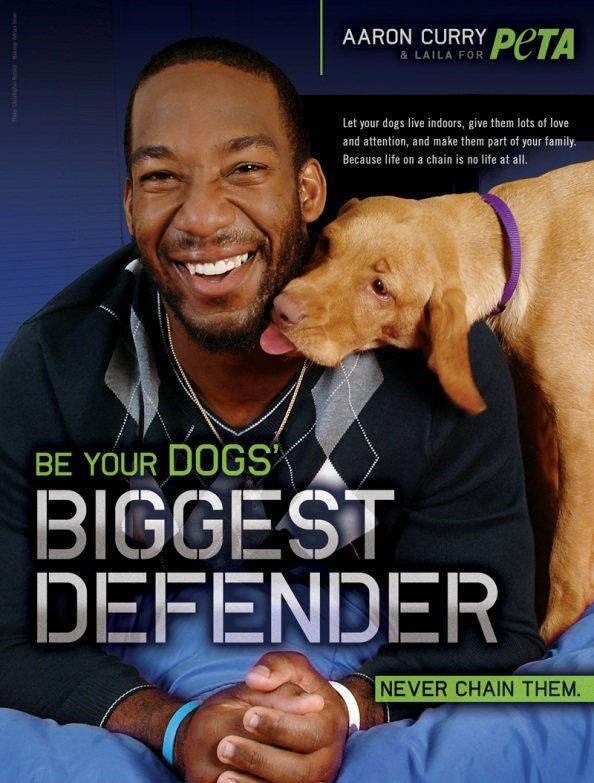 Aaron Curry posed with his rescued dog Laila for a peta2 "Be Your Dog's Biggest Defender" ad urging people not to chain their dogs. When he played for the Baltimore Ravens, Willis McGahee, now on the Denver Broncos, bucked the cruelty of fur by baring his tats—and much more—for a red-hot PETA "Ink, Not Mink" ad. Another Ravens player happy to show his skin to save animals' hides, Terrell Suggs is one of the toughest linebackers in the NFL, but he considers the production of fur "cruel and evil" and will never cross the line by wearing it. Tony Gonzalez, a six-time Pro Bowl veteran, also stripped down for PETA, alongside his wife, October, to declare, "We'd Rather Go Naked Than Wear Fur!" 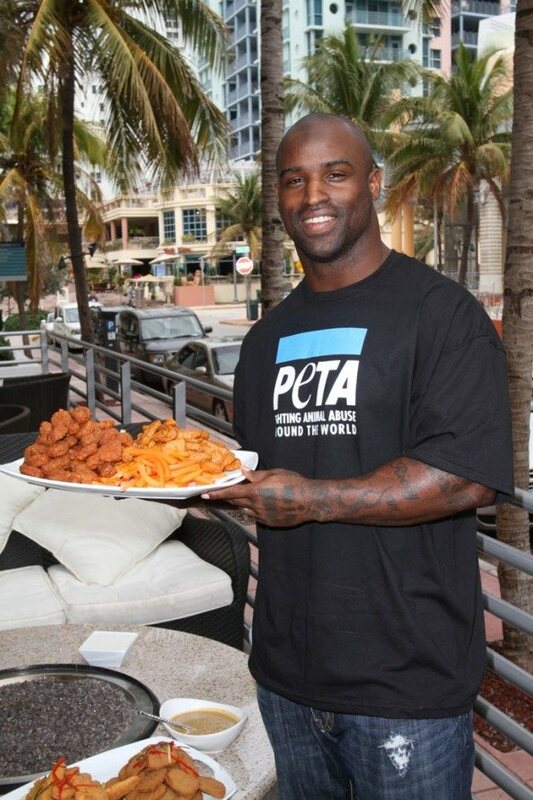 Ricky Williams, a vegetarian, hosted PETA's faux–chicken-wing taste test, crowning Gardein's vegan buffalo wings the winner. 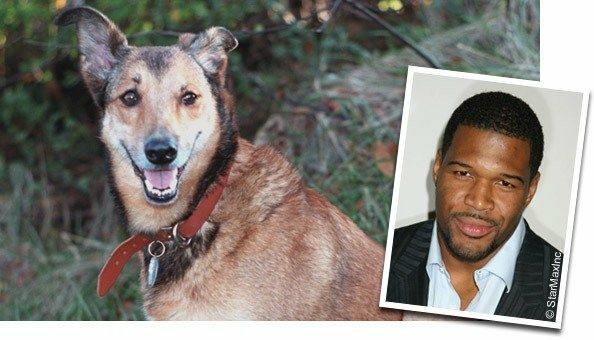 Former NFL star Michael Strahan has a new job as co-host of "Live With Kelly and Michael," but PETA helped keep him occupied making a public service announcement for "backyard dogs." 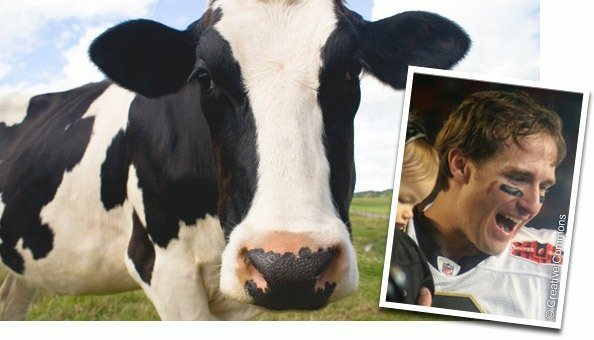 Drew Brees and his wife, Brittany, who are both lactose intolerant, teamed up with dairy-free brand So Delicious for a promotion benefiting the couple's charitable foundation—and anything that encourages nondairy living also helps cows used for milk. Even if you have no hope of making it to the Super Bowl, you can still be a champion for animals—learn how. Jeff Mackey had been a dishwasher, picture framer, software tester, project manager, LGBT advocate, nonprofit board member, and actor before becoming a blog writer for the PETA Foundation. He recently returned to college, where he is studying biomedical engineering (although he refuses to participate in dissection). He is the proud guardian of two ridiculously adorable hounds, Beau and Oliver.